The Extended Essay is an in-depth study of a focused topic. Through a process of independent research and writing, students are expected to produce a 4000-word essay. Core goals of the Extended Essay program are to develop the research, thinking, self-management, and communication skills that will enable them to engage in independent research with intellectual initiative and rigor. Specifically, students will be able to identify, locate, and effectively analyze relevant sources, then synthesize information into a clear and coherent reasoned argument. The Extended Essay process is designed to cultivate intellectual independence in a number of ways. 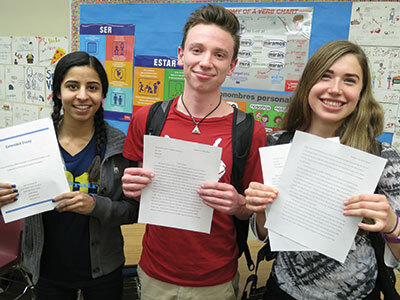 Students are given the independence to select and develop a topic that can hold their attention for a year of research and writing, which serves as a rehearsal for choosing studies when they arrive at college and university. In addition, students learn to navigate the ups and downs of any research process, guided by an advisor to develop the strategies that will serve them well in their post-secondary education.